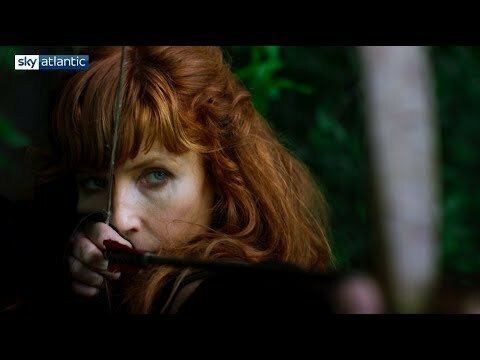 Britannia (2018) : Série TV de 2 saisons et 15 épisodes diffusée sur Sky Atlantic (UK). Casting, acteurs, bandes annonces et actualités. 43 ans après J.C., l'invasion romaine de ce qui va devenir la Grande-Bretagne. L'armée impériale romaine retourne écraser la Britannia, un territoire mystérieux tenu par de sauvages guerriers et de puissants druides. 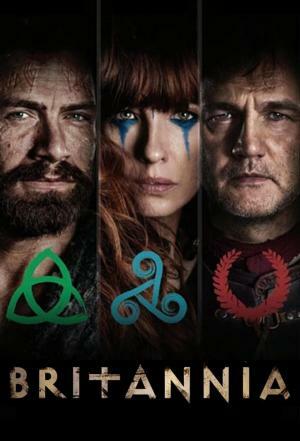 Casting de la série "Britannia"
S01E01 Episode 1 18/01/2018 In 43 AD, a nation is rocked by the arrival of an Empire. S01E02 Episode 2 25/01/2018 Having marked Rome's arrival with blood, Aulus sends envoys to parlay with the tribes of Britannia, while also looking to learn more about the Druids. S01E03 Episode 3 01/02/2018 Aulus is reborn, but his destiny remains unclear. Cait is able to locate her father, but she can't free him from the Roman camp alone. S01E04 Episode 4 08/02/2018 King Pellanor disowns Kerra and leaves her life in the hands of the Druids. But the gods' judgement is not what he expected. S01E05 Episode 5 15/02/2018 The gods have spoken, but Kerra must decide if she will accept their ruling. Antedia seals an alliance with Rome - on one condition. S01E06 Episode 6 22/02/2018 After their long ordeal, Cait and her father finally arrive at the safety of the Cantii citadel, but a demon is on her trail. S01E07 Episode 7 01/03/2018 Cait and her father seek shelter in the ruins of their old home, where she is visited by someone she never expected to see again. S01E08 Episode 8 08/03/2018 The battle of wills between Kerra and Antedia intensifies, as the Regni play their trump card. Aulus enlists deadly exiles to find Cait. S01E09 Episode 9 15/03/2018 The end appears to be close for the Cantii, and Aulus unveils how the Roman Empire truly conducts business. Envie de parler de Britannia ? Les discussions sont là pour vous. Retrouvez toutes les informations sur Britannia lancée en 2018 : synopsys, casting complet, acteurs, scénariste, réalisateur. Découvrez des séries similaires à regarder également. Faites vous une idée de la série grâce à la note des membres et aux critiques des internautes.